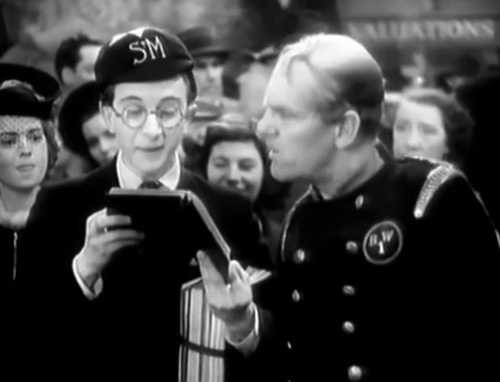 (SPOILERS) Will Hay’s last film with Graham Moffatt (the tubby young impertinent one) and Moore Marriott (the squeaky old put-upon one) in a relationship that had spanned five years and seven films (albeit not always featuring all three of them). 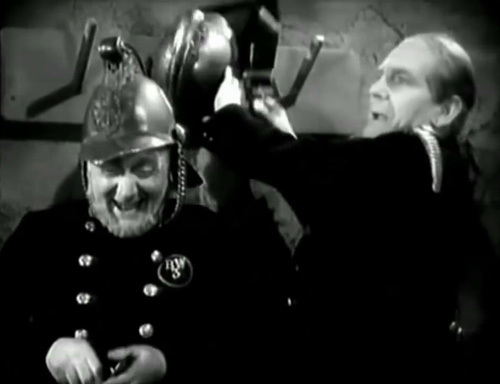 After this, Hay would embark on a series of World War II propaganda comedies, partnered by Claude Hulbert. Where’s That Fire? 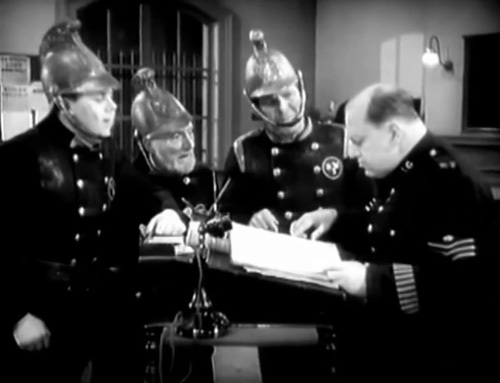 is a so-so goodbye to the line-up, lacking the sheer inventiveness of the previous year’s Ask a Policeman, and heavily reliant on slapstick rather than Hay’s preferred wit. Perfect foils that Moffatt and Marriott were, Hay might have been right to break up the band. Where’s That Fire? was out of circulation for a long time owing to a rights issue; the BBC unearthed it in 1975, but until recently it wasn’t available on DVD. It’s public domain, and viewable on YouTube. I hadn’t seen it since the ‘80s, and remembered it as something of an interchangeable equal to Ask a Policeman. 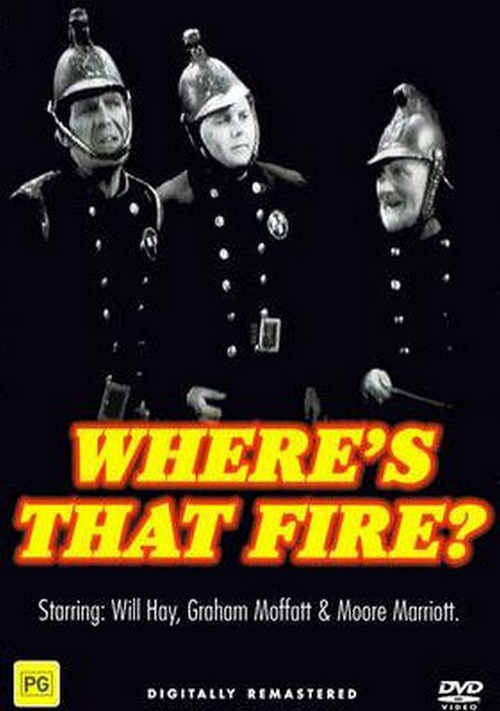 While Fire escapes the ignominy of never having been remade by Cannon and Ball, it does very much run with the pedestrian premise of “We made the boys rozzers, why not make them firemen now” without having thrashed out a good storyline first. 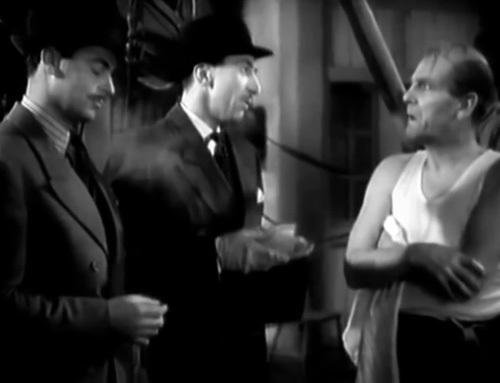 Hay is Captain Benjamin Viking, accompanied as ever by Jeremiah Harbottle (Marriott) and Albert Brown (Graham Moffatt), manning the antiquated Bishop’s Wallop (great name) Fire Station. Par for the course, they’re an incompetent/ light-fingered trio, and Viking is preoccupied with his inventions in the basement, developing “a scientific formula for putting out fires”. They completely fail to show up to a huge oil factory blaze because (firstly) they didn’t hear the bell (“How long has that sock been there?”; the item of footwear has muffled the bell “Since you had insomnia” last week) and then because they get lost en route. They failed to put out blazes in 17 properties over the previous six months (they claim 16, which still seems like an awful lot for a little village; perhaps writers Marriot Edgar, J.O.C. Cotton and Val Guest – director of the Cannon and Ball The Boys in Blue debacle – should have gone with an evil arsonist plot). Given one more chance, they visit a London fire station (where they proceed to pinch a load of equipment) before returning with the motivation to upgrade their own. 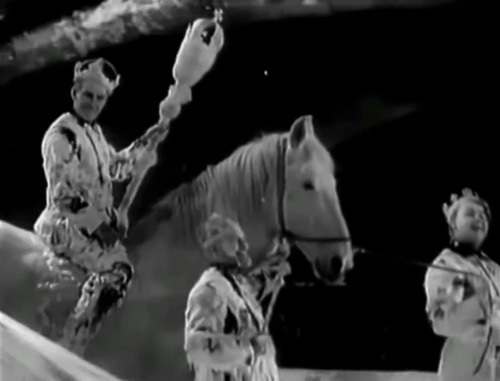 This introduces the most prolonged and successful sequence of the picture, one that takes it up to the half hour mark (still without the plot “proper” introduced). 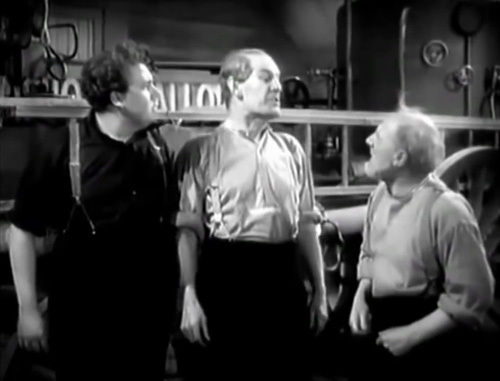 Attempting to install a fireman’s pole (“All we’ve got to do is elevate the pole in the perpendicular”), the trio get into a terrible bother, interrupting traffic, managing to wedge it across the width of the street outside, and finally attempting to lift it through the first floor window and skylight of house where Albert’s dad lies stricken with a broken foot (“Get that parcel out of the way” instructs Viking as he kicks the invalid’s plastered foot). 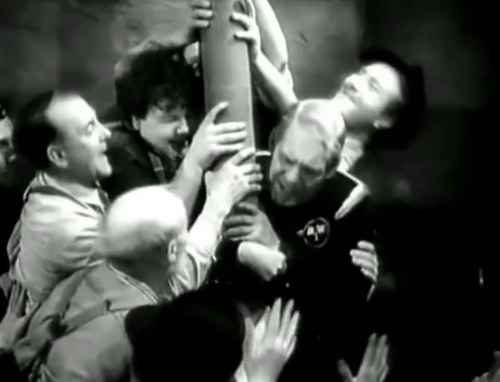 The tiny room ends up jam-packed with people, including the local doctor and Charles Hawtrey’s know-it-all swot Woodley, who informs Viking he could sort it out very quickly, if only he applied Euclidean geometry to the problem. The confined chaos reminded me a little of the increasingly cosy cabin scene in the Marx Bothers’ Monkey Business. Hawtrey had earlier appeared with Hay in Boys Will Be Boys and Good Morning, Boys and would later grace The Ghost of St Michael’s and The Goose Steps Out, and seems far more invested in his overgrown schoolboy act than his better known Carry On… persona of 20 years later. He’s an effective source of superior antagonism for Hay, something he doesn’t get from his other associates, and Hay inevitably resorts to threats of violence (“”Well, we did intend to put it up in our fire station, but if you don’t push off, we might change our minds”). Marriott always walks off with scenes in these pictures, much in the way Harpo steals the limelight from Groucho. 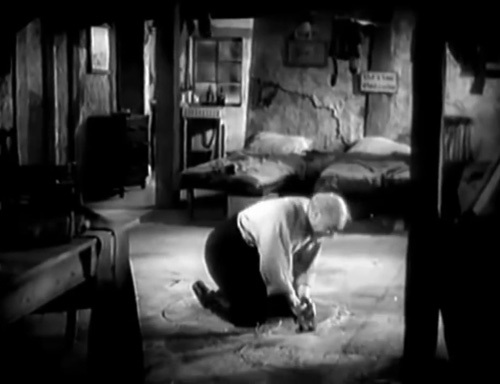 My favourite Harbottle moment here is prior to this, when he finishes cutting a hole in the floor for Albert. Naturally, Harbottle is kneeling within the circle of the hole and plunges through the floor on top of an unsuspecting Viking. While Moore is usually insolent, Marriott is perpetually downtrodden, here coming out worst when the promise of £30 finds Hay defeating him from taking his share (“You always pick on me. Anyone would think I’m a boy”; Marriott was known for playing above his age, and he was only three years older than Hay). Viking: Is it a big fire? Harbottle: No, I’ve only just lit it. It’s Harbottle who resorts to arson (“If I can’t get paid one way, I’ll take it another”) ill advisedly setting a fire at the petrol statin, which can’t end well (Viking, like David Bowie, ends up trying to put out the fire with gasoline). So the plot the firemen eventually become embroiled in is a rather perfunctory afterthought. A crew of thieves rent their fire engine (for that £30) because it’s a near double for the one used at the Tower of London; they’re planning to steal the Crown Jewels. All that’s left is for Viking, Harbottle and Albert to go looking for their missing engine and muck about in an enormous array of foam (courtesy of Viking’s lucky/unlucky experiments with homebrew). Harbottle in particular gets smitey with a sceptre. Their overcoming the villains is quite by accident (“This is our fire. We were here first” announces Viking as he engulfs them in foam), and the thieves have cause to issue a suitably Scooby Doo grievance (“We would have got away with them too, if it hadn’t been for this muck”). Hay’s great crabby, and mercenary, fun of course (charged five shillings for the oats given to their horse, he tells the desk sergeant “You should have given him sawdust. He doesn’t know the difference”) and the three even come out on top this last time, with interest shown in using the fire fighting formula employed during their foam party finale. I found this webpage while looking for a still of Charles Hawtrey's character "Woodley" in "Where's That Fire". I'm somewhat of a hat collector, and had noticed the character's unusual school cap with a seven point star atop, and now...I want one.